Celebrating Independence day - A new event announcement !! To all the Indians, Independence Day is a day for unlimited joy and fun, in all respects. As freedom came after a long and hard struggle of our veterans, it is the sweetest element in the life of all Indians. Independence Day definitely means celebrating with food that you love the most. So, I thought we could all come together to celebrate this special day in a colorful way. Event runs from August 13th - 30th, 2012(EST). So entries within these dates will be acceptable. 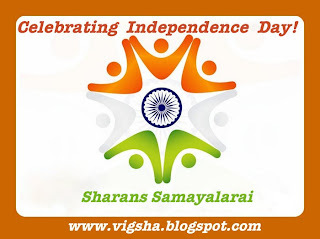 Send the food item which signifies Independence and also write why and how it does so. Be creative and colorful! 1. Entries for this event should relate our independence, our freedom, with one of our most liked food item. 2. It can be of any cuisine across courses and follow any method of cooking, let your imagination run wild. 3. Multiple entries are welcome and linking back to this announcement is a must. 4. Usage of logo is optional but I would be happy if you could use it, as it helps to spread word. 5. Archived entries are accepted as long as they are linked to this announcement post. 8. Non bloggers are most welcome to participate. Just send me the recipe with the below details to the above mentioned email. 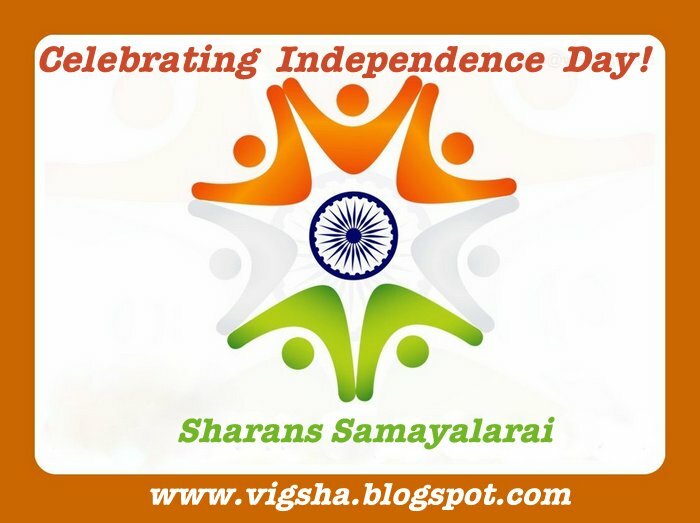 Wishing all my readers a very Happy Independence day!! Looking forward for your wonderful and lip smacking entries :) Lets get innovative and imaginative !! Wonderful event love to participate :) BTW, Are archived entries allowed dear?? Thanks a bunch dear :)) Yeah Archived entries are accepted, I shall update in the post too.. Thanks :) Following back !! Thanks Bhavna... Expecting your entries !! Nice event, happy hosting Sharans. I will try to send my entries. surely ..will try to post the entries. wonderful event... will link my entries soon..
Lovely event and thanks for stopping by..Will sure sent some entries dear..
Nice tips on this site. Where is your follower widget? Check the top right hand side you will follower widgets for find facebook, twitter, networked blogs and friend connect.. You can join in any of these..
A great event! will surely explore recipes that suits your event and will link. nice event..will link up soon. Wonderful event. I have few things to add to this event. Thanks Priya :) happy to follow you :) expecting your entry !! Thanks :) Expecting you entries !! I have linked your entry !! Thanks in advance, wish to expect some more entries from you.. Please comment on this link on my blog .Awaiting to hear it from u. Thanks dear :) Happy to follow you :) Expecting your entries !! Thanks a lot dear :))) Expecting your entries !! Thanks Gauri :) Expecting your entries !! Thanks Roshini :) Expecting more recipes from you !! hifreedom related sharan sent in my link .......its not the tricolour but its close to my heart,made in my great grandfathers house and he was a freedom fighter. hope you are fine. i made my last entry for your event . see my post i have mentioned that i made these idli specially for your event. Thanks dear :) Very sweet of you !! i know it too late submission for this event...somehow i forgot this post.http://easy2cookrecipes.blogspot.co.uk/2012/09/dosa-roll-tricolor-toppings.html . Please add this to your roundup. ohh... I missed you entry dear.. Thanks a bunch for adding it now, I will surely add it in the roundup..